This ground-breaking book comprehensively addresses an area of major and sustained concern: how to improve the use of research evidence and enhance educators’ research engagement as a route to the improvement of educational practice. It focuses on the topic of knowledge brokering and mobilisation in education, and its role in fostering evidence-informed practice. 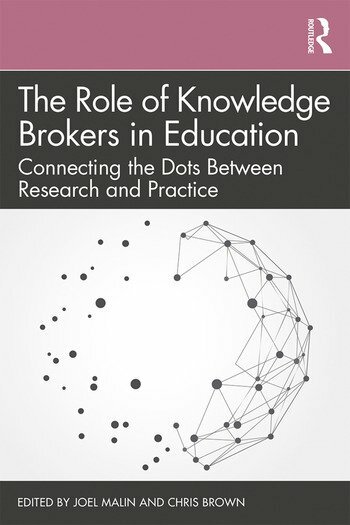 Written by internationally-recognised leaders and expert contributors, The Role of Knowledge Brokers in Education brings together extensive and global perspectives in an accessible yet comprehensive volume. This book is an invaluable resource for educational leaders worldwide who are interested in using or generating research for school improvement, as well as researchers, academics and students in schools of education. (Chapter 2) –Educational Brokerage and Knowledge Mobilization in the United States: Who, What, Why, How? (Chapter 7) – Knowledge Brokering: "Not a Place for Novices of New Conscripts"
(Culminating/Moving Forward - Chapter 13) – Conclusion: The Future of Research Use? Dr. Joel Malin is an assistant professor of educational leadership at Miami University-Oxford, Ohio. Dr. Chris Brown is Professor of Education in the School of Education and Childhood Studies, University of Portsmouth.